Reaction Rocket, Rockets: Educational Innovations, Inc. The rocket shoots up dramatically higher than its original drop height. Explaining energy conversion was never this easy... or this much fun! Appearances can be deceiving. 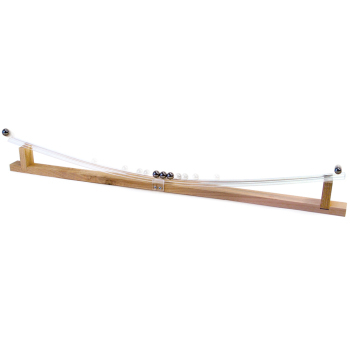 This rubber ball launcher and plastic rocket may look simple, but they're a sure-fire way to provoke a WOW reaction - and introduce students to Newton's Laws. Hold the top of the launcher and drop it straight down onto a hard surface. The rocket shoots up dramatically higher than its original drop height. Explaining energy conversion was never this easy...or this much fun! Comes with one launcher, two rockets. Class Kit includes 15 launchers and 30 rockets. Colors may vary. I purchased the class kit and used the lesson provided to teach about transfer of energy and Newton's Laws. My students loved the activity and now I have a new go-to lesson! Thank you, Educational Innovations, for providing such fun science materials. You're my favorite company! My students had fun with these and they generated a lot of excitement but they didn't last long. 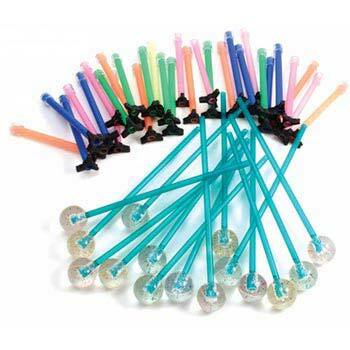 The straws slid out of the balls and the some of the balls broke in-half. We taped some of them back together but it's really not worth the price for the overall quality. Too bad since the kids really liked them while they worked. Owner Response: Hello Margaret, I have to say, this is a first! These rockets have a history of being very durable. Our apologies! One of our customer service representatives will be in touch to make this right for you. This fun and engaging tool is easy to use. Scientist (students) can easily change a variable and continue experiment with little need for teacher or parent support. 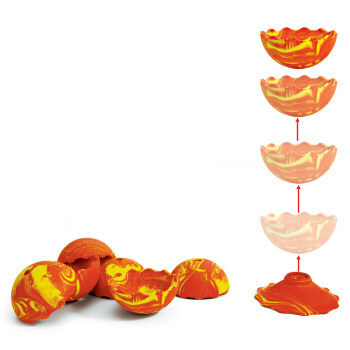 This is a simple device that works well as a hands-on class activity for students. Each pair of students is handed one rocket to test. They then compose written explanations of how it works, the physics principles involved, and a plan for an experiment that could be designed to test aspects of the concept. Students then share ideas with the class. Students can use Reaction Rocket to design, test, and refine a device that converts energy from one form to another. Students can use Reaction Rocket to plan and carry out fair tests in which variables are controlled and failure points are considered to identify aspects of a model or prototype that can be improved. 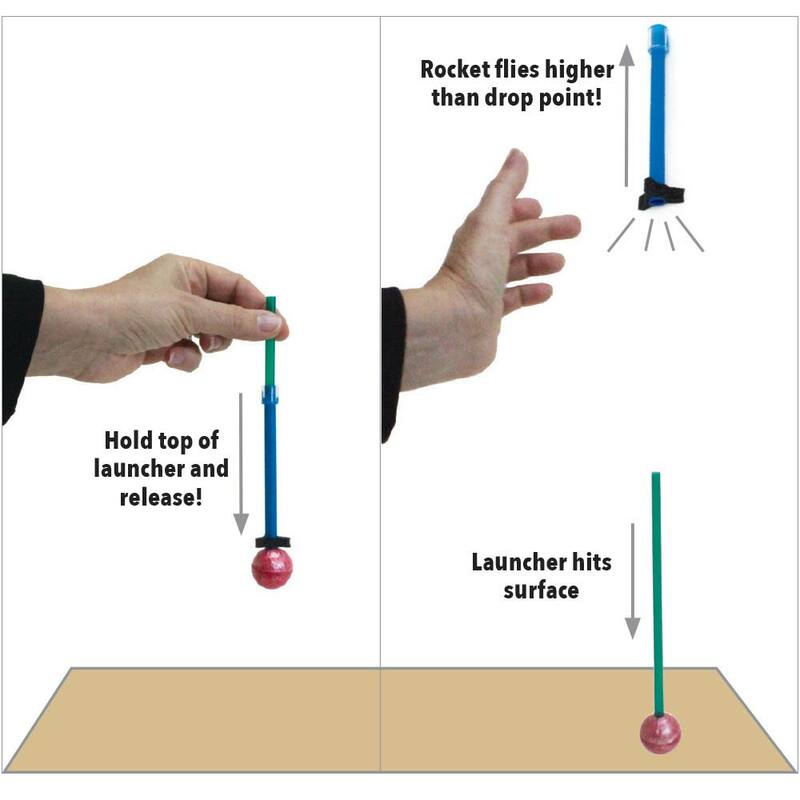 Students can use the Reaction Rocket in an investigation to explore flight and analyze data to determine if a design solution works as intended to change the speed and direction of an object with a push or a pull. Students can use the Reaction Rocket to plan an investigation to ask questions, make observations, and gather information about a situation people want to change to define a simple problem that can be solved through the development of a new or improved object or tool. Students can use the Reaction Rocket to develop a simple sketch, drawing, or physical model to illustrate how the shape of an object helps it function as needed to solve a given problem. Students can use the Reaction Rocket in an investigation to utilize engineering skills and proper testing methods of materials and design. Students can make observations and/or measurements of the Reaction Rocket flights in an investigation Students can utilize an object's motion to provide evidence that a pattern can be used to predict future motion. Students can use the Reaction Rocket in an investigation to plan and carry out fair tests in which variables are controlled and failure points are considered to identify aspects of a model or prototype that can be improved. Students can use Reaction Rocket to construct, use and present arguments or experiments to support the claim that when the motion energy of an object changes, energy is transferred to or from the object. Students can use Reaction Rocket to develop a model or experiment to generate data for iterative testing and modification of a proposed object, tool or process such that an optimal design can be achieved. Students can use the Reaction Rocket to plan an investigation to provide evidence that the change in an object's motion depends on the sum of the forces on the object and the mass of the object. Students can utilize the Reaction Rocket as a prototype to develop a model to generate data for interactive testing and modification of a proposed object, tool, or process such that an optimal design can be achieved. Students can use Reaction Rocket to design, build, and refine a device that works within given constraints to convert one form of energy into another form of energy. Students can use Reaction Rocket in an investigation to design a solution to a complex real-world problem by breaking it down into smaller, more manageable problems that can be solved through engineering. Students can use the Reaction Rocket to plan a flight investigation to gather scientific evidence. Students can analyze data to support the claim that Newton's second law of motion describes the mathematical relationship among the net force on a macroscopic object, its mass, and its acceleration. 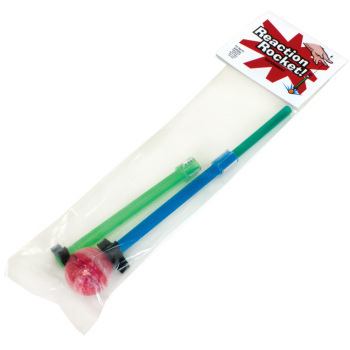 Students can use the Reaction Rocket as a prototype in an investigation to provide evidence that students will use to modify a rocket. Students-can design a solution to a complex real-world problem by breaking it down into smaller, more manageable problems that can be solved through engineering. Students can use the Reaction Rocket to plan a flight investigation that includes the use of computer simulation to model the impact of proposed solutions to a complex real-world problem with numerous criteria and constraints on interactions within and between systems relevant to the problem. Students will get a blast out of launching rockets with the Reaction Rocket A classroom/wind free environment is all you need to start flying. The Reaction Rocket uses gravity for its initial motion and the transfer of elastic potential energy to propel the rocket. Allow students to design and manipulate variables such as drop height and launch surface to explore many facets of flight, force and motion. 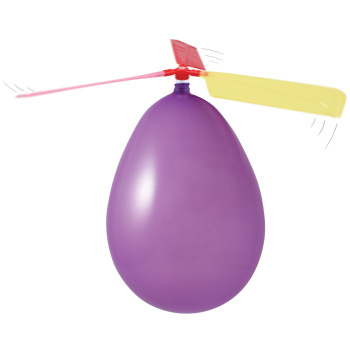 Encourage students to utilize mathematical equations in their investigations for flight and landing proximity. Set up height measurements and targets for criteria based hands-on learning. An interesting element to introduce into the lessons and investigations is the use of the slow motion video option on many phones. The slow action will allow students to look more closely at the forces during an investigation. Students can utilize the stop action on the video to collect precise data/measurements to identify parts of flight. Private industry is now the guiding force in the United States space program. Challenge students to research current space programs and then come up with their own real world problems that need engineering solutions. Enable students to break down the flight tasks to embark on their own Reaction Rocket mission.